It was an exciting week because I gave my seminar, How to Write the Half Hour Pilot Treatment at New York Women in Film and Television (NYWIFT). Over thirty people attended, and I was having so much fun, I neglected to get a photo! The most important concept that we discussed is that when creating a television character, he or she must have a life situation that holds an impossible dilemma. By this I mean, a situation that can never be resolved. This way the series can go on indefinitely. An example of that is in the Breaking Bad TV series. The main character, Walter White, has cancer, and cannot provide for his family, so he becomes a drug dealer. In a comedy, the dilemma is not as life threatening but must be even more impossible to resolve. For example, in the classic sit-com, Everyone Loves Raymond, the main character wants to have both his mother and his wife. Don’t go out with your material until you have this key element in your story! NYWIFT is an amazing organization, with over 2400 members. They have many great seminars that can be attended by nonmembers, and I recommend you check it out. As a writer, I look for symbols to inspire me. 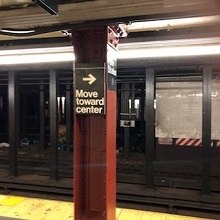 I was heading for a subway, and took this photo — to keep me centered. Enjoy!